After graduation joined the US Navy and served aboard a destroyer during the Korean War. Following Korea, received USN pilots wings and served 4 years with Naval Fighter Squadron 103. 1959, graduated from the US Navy Test Pilot School and was assigned to the Naval Air Test Center until selected by NASA. 1963, assigned to Environmental Control, Survival and Personal Equipment for Project Gemini. 1965, Pilot of the first manned Gemini mission performing the first orbital maneuvers by a manned spacecraft. 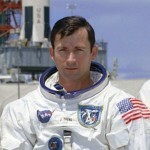 Young was the first of the second group of astronauts to fly in space. 1966, Command Pilot of Gemini 10 featuring the first use of a docked Agena stage to boost a spacecrafts orbit. 1969, CMP of Apollo 10, the dress rehearsal for the first manned lunar landing. 1972, CDR of Apollo 16, the 5th lunar landing mission. 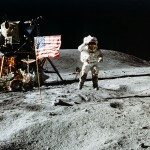 Young became the 10th man on the moon and spent more than 20 hours outside the LM exploring the Descartes landing site. 1973, appointed Chief of the Space Shuttle Branch of the Astronaut Office. 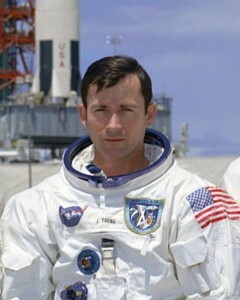 From 1974 – 1987, Chief of the Astronaut Office. 1976, Retired from the US Navy as a Captain after 25 years of active service. 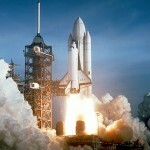 1981, CDR of STS-1, the first flight of the Space Transportation System (the Space Shuttle). 1983, CDR of STS-9, the first spacelab mission in the Shuttle program. 1987-1996, Special Assistant to the Director of JSC for Engineering, Operations and Safety. 1996 to present, Associate Director, Technical, Johnson Space Center, Houston Texas.